An excursion to downtown Charlotte Amalie is a high point of any proper vacation in St Thomas. Duty free shops, a colorful outdoor Vendor’s Plaza and a working waterfront, complete with cruise ships, ferries and freight boats, unite locals and tourists and create a harmonious blend of sights and sounds. Today, sailors on 77 teams at the International Rolex Regatta made the obligatory trip downtown not by Safari taxi but by boat - actually, their own race boats. The first of today’s two 'town races' went from the eastern end of St. Thomas, where the regatta’s host St. Thomas Yacht Club is located, to Charlotte Amalie Harbour, giving spectators an eyeful as they watched from scenic overlooks and other vantage points along the island’s hilly coastline. After a rainbow of spinnakers graced a downwind finish, the fleet turned around and headed back from where they came, counting the return trip as their second race. In CSA Spinnaker 1, Mark Plaxton’s Melges 32 Team INTAC/Crowley finished 1-2 today to lead, leaving second to Andrea Scarabelli’s Melges 24 Budget Marine and third to another Melges 32, David West’s BVI based Jurakan. Beer added that he is involved in developing a plan to entice the large group of Melges 32s in the States to put Caribbean racing, including the International Rolex Regatta, on their one-design class racing schedule. “The class is highly competitive, it’s a technical boat - fast, well sailed - and we would get our own one-design start. I mean, look around; it doesn’t matter if you are sailing an IC 24 or a TP52, it’s the best sailing in the world here." In CSA Spinnaker 2 class, two Floridians hold first and second place in the 11-boat fleet: Richard Wesslund’s J/120 El Ocaso has five points after finishing 4-1 today, while Calvin Reed’s Beneteau First 40.7 Elandra of Hamble also has five points, on merit of a 3-2. Three 52 footers took podium positions after cumulative scores were tabulated in the six-boat IRC 1 class. 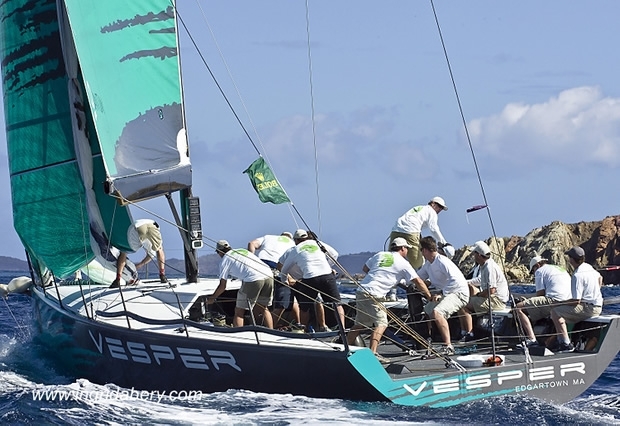 Jim Swartz’s Vesper/Team Moneypenny holds three points over the five posted by Austin and Gwen Fragomen’s Interlodge, leaving Richard Oland’s Canadian entry Vela Veloce, in third place, also on five accumulated points. Antilope, Willem Wester’s Grand Soleil in the nine-boat IRC 2 class, is leading after winning both races today. In second, with finishes of 3-2 is Phil Lotz’s Club Swan 42 Arethusa. Bernardo Gonzalez’s Beneteau First 35s5 Bonne Chance is leading the 10-boat CSA Non-Spinnaker class after posting a 1-3 today, worth four points, while Tony Sanpere’s J/36 Cayennita Grande is in second, also with four points, after finishing 2-2. The IC 24 One-Design class, with 16 boats, added one more short distance race to its schedule today after finishing the 'town races'. Jorge Santiago’s DonQ Cristal, leads with 12 points, but both the second and third place finishers share the same point score. They are Chris Cuerreri’s Soggy Dollar BVI and William Bailey’s Team INTAC JV. In Beach Cat class, Jorge Ramos’s Hobie 16 Universal posted a 2-1 to lead a nine-boat fleet. Racing continues tomorrow (Saturday) with as many as eight windward/leeward races for the IC 24s, while all other classes will sail a combination of island and/or distance races on the south side of St. John. Sunday features as many as six races for IC 24s and two races for all others on Pillsbury Sound. Racing starts at 10 a.m. each morning.